One of the important things that you need to consider when choosing a backpack is protection from the elements. No one wants to deal with a soaking jacket and backpack if it can be avoided. The degree of protection may vary across bags and you need to make the choice of how much waterproof you want to depend on your specific requirements. It is really hard to choose and buy best waterproof backpacks. Here are we Family Camping Center, may able to help you. Traveling can be a lot fun if know how to choose a good backpack. Packing for camping activities can be a challenge if you do not keep your belongings properly. Before you start shopping for waterproof backpacks, you need to know the difference between water resistant backpack, waterproof bags and 100% waterproof backpacks. A water-resistant bag can handle a light and short shower. If you leave it in the rain for a longer period of time, the water may get in eventually. This may damage all the electronic items and other essentials that you had kept inside the bag. These bags can take a heavy downpour in their stride and may be able to handle long hours of hiking in the rain. Even when they fall in a river or other water body for a short period they may remain dry. However, if they are immersed for a long time in water they may become wet. These backpacks are completely waterproof. They are an ideal choice for any water-based activity that you may indulge during camping. They remain dry irrespective of the weather conditions. They can also handle getting submerged in water for a very long period of time. A good backpack becomes your home when you go camping outdoors. It shelters your food, clothes and other necessities that you may need. If you want to have an enjoyable experience in the outdoors, it is important that you make a good choice. Most of the multi-day and overnight backpacks are not completely waterproof. Avoid going camping if you do not have the best waterproof backpack available in the market. Risking a downpour with weak equipment could be the difference between life and death in certain terrains. The best necessity of a backpack for camping is that they enable you to be mobile even during your camping trip. You can easily carry your gear into the wilderness. This enables you to explore your surroundings without having to sit in the same place all through the camp. The backpack can be your best friend when camping. You can carry it wherever you want and it can serve multiple purposes at the same time. As they are light they can be carried for long distances without much of an effort. They are ideal for many activities such as cycling, canyoneering, caving, hiking and running. The other important benefit is that you can stay organized during the entire camping period. The backpack can fit everything you want for camping. They are normally large enough to carry supplies that can last for at least a couple of days. When you choose a camping backpack you may be able to keep the essential and non-essential things separately. Things that are not in use can be kept in the bag and this ensures that there is not clutter at the camp site. If you unpack and keep the entire gear inside your tent, it can create clutter within a few minutes. This can be difficult to organize all over again. You will also know where to look for certain things in the bag when you are organized. Apart from been great for storage and mobility, they can also serve as an emergency tool. Most high-end backpacks have metal frames and these can be used to make a splint in the woods if necessary. The straps can be used to create slings and used as first aid tools when someone is injured at the camp. 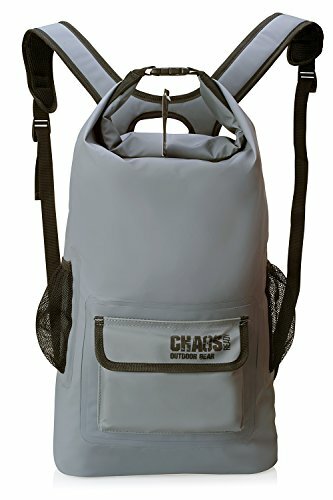 The Chaos Ready is a premium quality backpack that is built for the outdoors. It has got you covered whether it is cycling, hiking, fishing, sailing, rafting, surfing or any other camping activity. The mesh sides and easy access front pocket make it an ideal place to keep all waterproof accessories. The bag has 4 main compartments. One of the compartments is the main bag whereas one is an accessible front pouch and two side bags. It has a 22-liter main storage compartment. This help in accommodating items for at least a 3-day trip. Flexible yet rugged as it made from 500 PVC tarpaulin material. This enables it to withstand the rough and tough of a camping site. The shoulder straps are padded and comfortable making it easy to carry for long distances. It is 100% waterproof. This means it stays dry and clean even during a heavy downpour. Even when you dive into the river with the backpack, it still stays dry. When it is packed and zipped, it does not let a single drop of water enter it. The water resistant fiber ensures that water slides down swiftly after rains. The extremely strong material makes it durable and provides value for money by lasting for many years. It helps protect it from dust, water, and sand at the camping site. The tri-fold buckle system is easy to use and ensures that you carry the backpack for long periods. The high-frequency seams are welded to give it extra strength. It is easy to clean, wipe and store away. Even if it gets dirty, you can easily wash away the dust to make it look as good as new. It lags behind in overall comfort. This means that you do not feel comfortable carrying it for longer durations. As there are no extra side belts the entire pressure is on the shoulders and this can be tiring to carry during camping expeditions. This bag is considered the best choice for camping activities such as climbing and cycling. The design can never go out of fashion as it can be carried in four different ways (luggage, portable, messenger, and knapsack). As you need to carry all your travel essentials, it is important that the backpack has enough space to accommodate everything and luckily this bag does have the space you need to carry all that you need. The backpack has a large main pocket and this can be used to carry all the belongings. It has a total of 4 bags and these include main bag, front bag, side mesh bag and vice bag. Contains a strong hook for climbing. The unique coded lock keeps all items safe from theft. Most camps do not have additional security and you need to take care of your items. The lock on the back ensures that no one is able to look inside without your permission. 35 liters capacity makes it fairly large in this category. This makes it a favorite choice of campers, as they can carry more things. People going on longer camping trips want a bag that can offer them the comfort of taking more things. The zipper pockets keep everything safe and waterproof. All essential items can be kept in these pockets such as small electronic items and they will be completely safe from different weather conditions. The chest straps and portable belts ensure that the weight of the bag is evenly distributed. If you are hiking this can be a big advantage as you may be able to carry the bag easily for longer periods. Not long lasting and durable. Durability is compromised and it is not worth the high price. The material of the bag is not strong and may face wear and tear over a period of time. Buying a backpack involves a lot of investment and if the bag does not last for long, it can be a waste of money. The stylish looks make it a perfect companion to carry on any of your camping trips. It can be easily folded and does not occupy much of space when not in use. It can be converted into a good size backpack within minutes. If the backpack is not waterproof, it may not serve the purpose during camping and luckily this bag ensures that all your valuable belongings stay dry and safe during the entire camp period. Big main compartment with two front zipper pockets to hold small and large items easily. Keep all things in an organized manner with different pockets holding different things. Long lasting and durable with no wear and tear even when used in difficult terrain. Most camping sites are rough and if the bag is delicate, it may not be able to last longer. Good water resistant backpack that ensures that all things remain safe even during rains. Even when the bag accidentally falls in water, it remains dry. Ideal for day and long camping trips as it can accommodate a lot of things inside the many compartments. Lightweight makes it easy to carry for long distances. No additional chest and waist straps. This can put a lot of stress on the shoulders and if you had packed it with a lot of things, you may not be able to carry it easily. The padded shoulders do not provide comfort. If you want to select the best waterproof backpack, you need to ask yourself a few questions. How long is the camping trip? Where are you traveling and what the weather conditions of that area? Depending on how long the camping trip is you can make the choice of backpacks. The items that you carry with you may depend on how long the camping trip is. The size of the bag should not be too large so that you find it difficult to carry or too small as you may not be able to carry the essential items. If you are camping for 1 – 3 days, you may require a 30 – 50 liters backpack to keep everything needed for the trip. A camp of 3 – 5 days, you require 50 – 70 liters whereas for a 5+ days camp, you require 70+ liters. When you know the duration of the camp trip, you may be able to choose a backpack that ideally fits your specific requirement, be it sand, the wind, rain, or otherwise. Before you start off on any kind of camping trip, it is advisable to check the weather. If it is expected to rain, you need a 100% waterproof backpack so that you can keep everything safe without having to worry about essential items getting drenched. It is always best to be prepared for the worst weather conditions as things may turn messy within a few hours of bad weather. Similarly, if you had planned a riverside camp or hike near a river, you may need a waterproof bag as proximity to water may at times result in accidents where the bag is dropped in the water. A waterproof backpack has many advantages during camping. It is not just strong and light but also keeps all your gear dry and safe. They are durable and this ensures that water does not seep in even in extreme weather conditions. Before you make the choice of buying a waterproof backpack, you need to consider the purpose, size, weight and cost. Read reviews of the best backpacks available in the market so that you are able to make an informed choice. Compare the many features before buying so that you get value for your money. You no longer have to be confused when shopping for the best waterproof backpacks. All that you need to do is to read reviews of the best three waterproof backpacks available in the market. Best of luck in all of your shopping needs and make sure to stay safe while hiking the trails or making your own path.